Bed bugs are parasitic insects that feed exclusively on blood, especially human blood. The name comes from the preferred habitat: beds. They are mostly active at night, but can be observed during the day in large populations. Although the bugs can be infected with several human diseases, there is no conclusive proof that these diseases are transmitted to people. 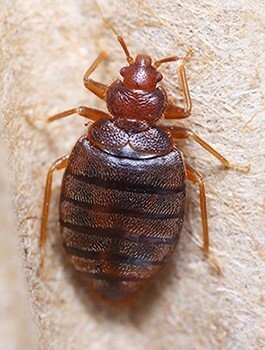 Adults bed bugs are flattened, oval, light brown to reddish-brown insects lacking wings. They are approximately 1/4-inch long and 1/8-inch wide. Their abdomens are segmented and covered with very short hairs that give them a banded appearance. Freshly fed nymphs will have a translucent abdomen with bright red blood in the intestinal tract that darkens over time. Bed bugs generally are attracted to the sleeping host by carbon dioxide exhaled during breathing. Prior to feeding, the bugs insert their mouthparts, which resemble a syringe, into the skin and inject saliva. The saliva contains an anticoagulant and a painkiller. Consequently, people do not feel the bite. After feeding, the bugs retreat to an area called a harborage. These harborages can be luggage, inside furniture, behind picture frames, inside laptop computers, behind ventilation grates or electrical wall plates. But, by far, the most common site is around the bed, either on the mattress, box spring, or bedframe. dust ruffles, mattress covers, around the folds of the box spring fabric, or on bed clothes are indications of their presence. 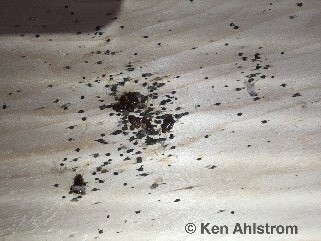 These spots are waste material containing dried blood which the bug defecates onto the material. Although there are chemical treatments available, control of bed bug infestations is best accomplished by exposure to heat. There is 100% mortality of all stages of bed bugs if exposed to heat exceeding 135 degrees for more than 2 minutes.